"Citizen diplomats" Heather Layton and Brian Bailey at the University of Karachi for the "Social Intervention Conference 2012: A Better Tomorrow for the Coming Generation". The conference was organized by two IVLP alumni. Heather Layton, a lecturer at the University of Rochester, and Dr. Brian Bailey, professor at Nazareth College, love to meet with International Visitor Leadership Program (IVLP) participants on a regular basis. And when they accepted an invitation to be the keynote speakers at the 2012 Social Intervention Conference in Pakistan for a group of IVLP participants, they took their dedication to the next level. As International Visitors travel across the United States to various cities, they meet with Americans both formally and informally. This network of 80,000 mostly volunteer “citizen diplomats” accompany the participants to local meetings, host dinners in their homes, and connect with them to share professional ideas and resources. Heather and Brian are two of these “citizen diplomats” who meet with IVLP participants in Rochester, NY. After meeting with a group of ten Pakistani International Visitors, in the United States for a “Community Dialogue and Dispute Resolution” project, they were invited to Karachi for a week of cultural and professional collaboration. In Pakistan, Heather and Brian met with professors, university students, and youth of Pakistan to create a Community Dialogue and Dispute Resolution program. The students and faculty took part in an art installation that involved writing letters to a future generation and envisioning a more just society. Heather states she has over 100 letters from Americans and Pakistanis that reflect possibilities for the future. 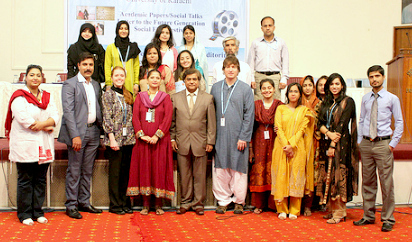 Brian also collaborated with IVLP alumni to start a “Social Film Festival” which showcased short films about social issues made by American and Pakistani youth. The winners received a standing ovation from the 300+ conference attendees. Back in the United States, Heather and Brian continue to meet with IVLP participants, particularly when it involves their areas of expertise. She focuses on art and art history, particularly mixed media, performance art and social intervention. He focuses on contemporary youth culture and literacy, particularly when adolescents use digital media art to create short films, music videos, animation, documentaries in school. Both enjoy the interactions of IVLP.